Chauvet-Pont D'Arc cave, in southern France, is one of the world's oldest and most impressive cave-art sites. 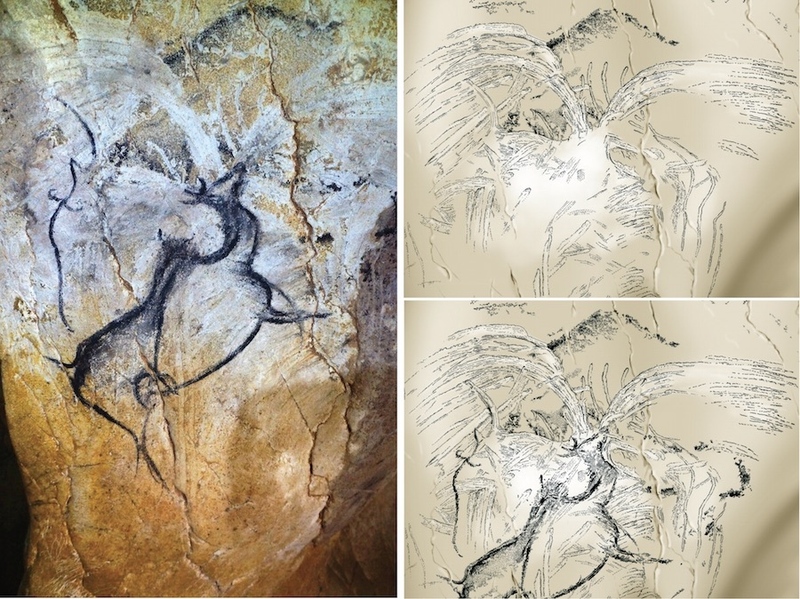 Discovered in 1994 and popularized in the Werner Herzog documentary 'Cave of Forgotten Dreams', Chauvet contains hundreds of paintings that were made as early as 37,000 years ago. Fearsome animals such as woolly rhinoceroses, cave lions and bears dominate Chauvet's imagery. But one of its innermost galleries -- named after a giant deer species, Megaloceros, that is depicted there -- also contains a series of mysterious spray-shaped drawings, partly covered by the Megaloceros painting. A nearby gallery holds similar spray imagery, as does a wall near the cave's original entrance, but researchers have not determined what the images represent. In the hope of calculating the dates of younger eruptions, Nomade visited Bas-Vivarais in 2012 and sampled rock from three volcanic centres. By measuring the levels of different isotopes of radioactive argon gas, his team determined that the region had been lit up by a series of eruptions between about 19,000 years and 43,000 years ago. The events would have been dramatic 'strombolian' eruptions, Nomade says -- named after those typical of the Stromboli volcano in Italy -- with lava spewing 200-plus metres into the sky and flowing down the volcanoes' slopes. Each cone would have erupted once or twice before going extinct. Maybe it's just blood coming from the animal's jugular vein? i wonder what the most dangerous animal that no longer exists, existed at the beginnings of man being in the world. Sabre tooth cats, cave lions, cave bears, dire wolves among the predatory animals. Early elephant types and rhinos, aurochs among non carnivores. Sabre tooth cats!!! Good Lord. it’s amazing we’re still around. i guess it was a numbers game. or we became intelligent enough to fight them off. i have no clue lol!! probably bad to be around a famished tiger!! You’d think there were cavemen who could draw better than a modern day 5 year old. It’d sure help in trying to guess at what the drawings meant. That’s no volcano eruption picture. What it is, is a pic of a camel that was drinking a glass of milk when the other critter (the squiggle on the left of the pic) told a joke that was so funny it made the camel expel the drink from its nose. that is terrifying. man has no capability of winning a battle with one of these things if it were 10 to 1, without weapons. why did the sabre tiger die out??!! with those teeth and its size and strength must have been incredible. i am dumbfound how a completely different kind of creature once dominated the planet, then after destruction, a new species came to dominate. how did the “mix” of chemicals end up being dinosaurs one time and humans the next? i know it is a simplistic question, but his stuff is way out of my grasp.